The Fourth Industrial Revolution (4IR) refers to the revolution process from steam power to the development of machine tools and the rise of factory machines. This revolution is evolving at an exponential pace rather than linear. Moreover, it is disrupting almost every industry in every country. The breadth and depth of these changes herald the transformation of entire systems of production, management, and governance. Technology is an integral component in disruptive innovations seeking to deliver a seamless and easy experience to users. Disruptive innovation and technologies often make people think about cutting edge (shiny/expensive) technology that is way out there in the future. Technological advancement has brought about a wave of disruptive innovations and ideas that have revolutionised the way we communicate, travel, shop, form relationships and so forth. Disruptive innovations are often products that emerge as solutions to problems or needs consumers encounter. They create new markets and do not necessarily compete against or outperform existing companies. The introduction of apps and sites like WhatsApp, Uber, Grab, Amazon and eBay and many more have redefined convenience for customers. 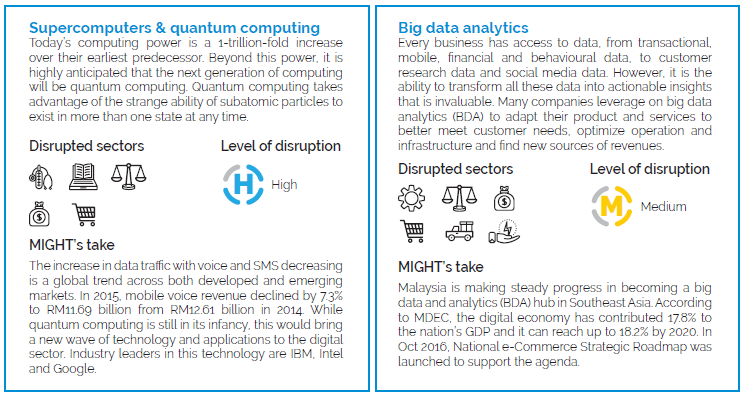 Digital disruption can reshape the market faster than ever before. In general, it affects industry in two main factors. First, is on the velocity of change and it involves the high-risk factors. Second, digital disruptors innovate rapidly, and then use the innovations to gain market share and scale far faster than the challengers who are still in physical business models. One of the examples is in the telecommunication industry, where WhatsApp overwhelmed the USD 100 billion global text messaging market through its free text messaging and now as an addition to the WhatsApp text messaging, it allows users to make free mobile voice calls. 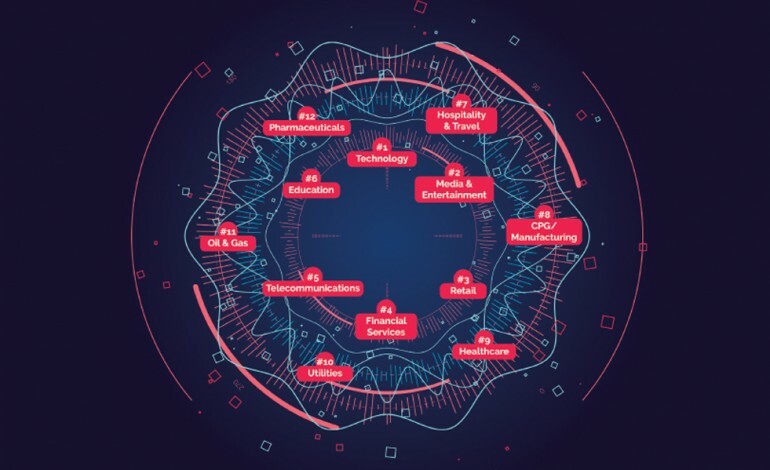 Digital disruptors and tech innovators are emerging in different industry sectors, threatening to overthrow conventional business models faster than ever. The implications are clear, either embrace digital transformation or stagnate and perish. To fully gauge the implications of digital disruption in emerging industries, a fundamental understanding of how digital disruption works is vital. Thus, digital vortex was introduced to help companies plan a strategy to exploit or counter any possibilities that may arise from digital disruption. 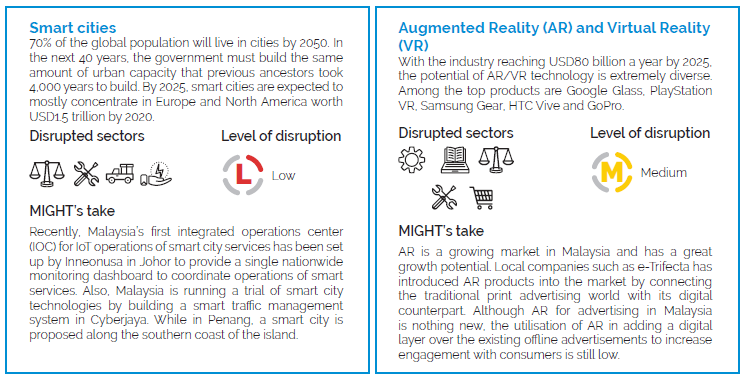 A digital vortex can be described as the inevitable movement of industries toward a ‘digital centre’ in which business models, offerings, and value chains are digitalised to the maximum extent possible. The construct of a vortex helps to conceptualise the way digital disruption impacts firms and industries. 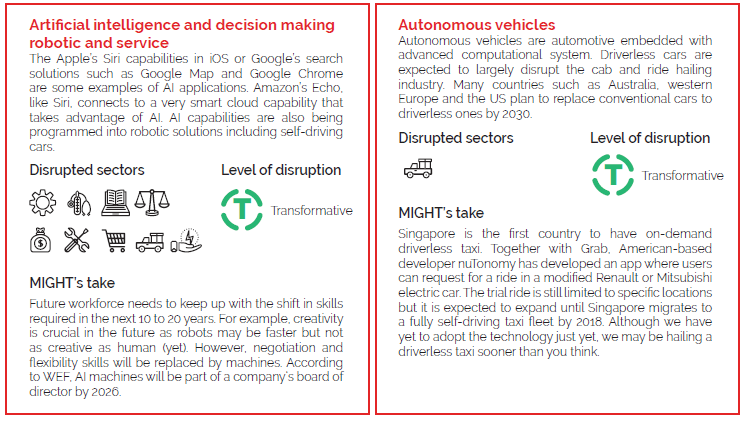 The following infographic highlights several technologies that will likely impact organisations and sectors moving into 4IR. The level of disruption can assist you in assessing your organisation’s readiness to employ these technologies. After all, these technologies are readily available, but it is up to us to make the most out of them. Disrupt or be disrupted, it is up to you! The mass transformation and full integration of the physical realm into the cyberworld. Driven by the connectivity of everything and everyone, this revolutionary wave will change the way we live, work and play. The increased adoption of not just automation using robotics but the introduction of artificial intelligence in knowledge work has reinvented the future of work, manufacturing and services. With the rise of thinking machines, what does change hold for humans? Technology has broken down barriers, opened access and given rise to the democratisation of power, economy and information. Systems previously limited to the selected minority have now become accessible to the general majority, opening new business models and information flows. 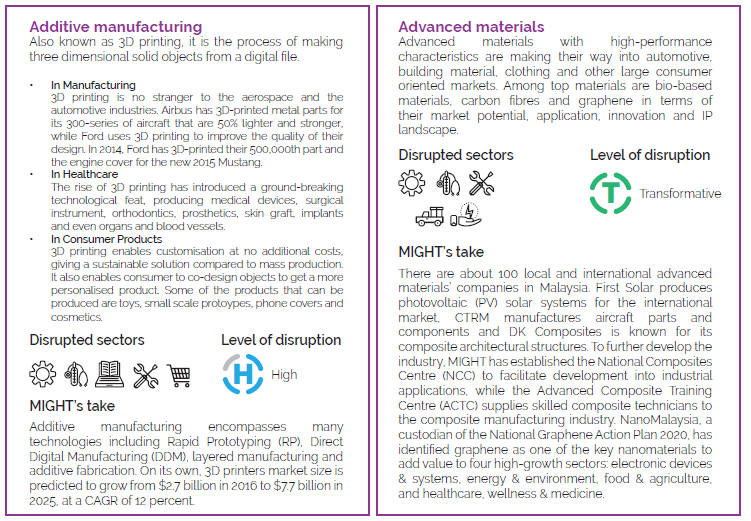 From mass production to mass customisation, the new wave of manufacturing will see global designs but local manufacturing to cater for changes in consumer patterns such as increased awareness on sustainability, individuality and functionality.